The three-day event got under way in good conditions from the Zuurberg Mountain Village, about 70km outside Port Elizabeth, with competitors facing 71km with 1 300m of ascent. The duo, racing in the colours of TIB-Silverback-Best4Sport, completed the course in 2:46:05 to establish a handy nine-minute lead in the overall standings. 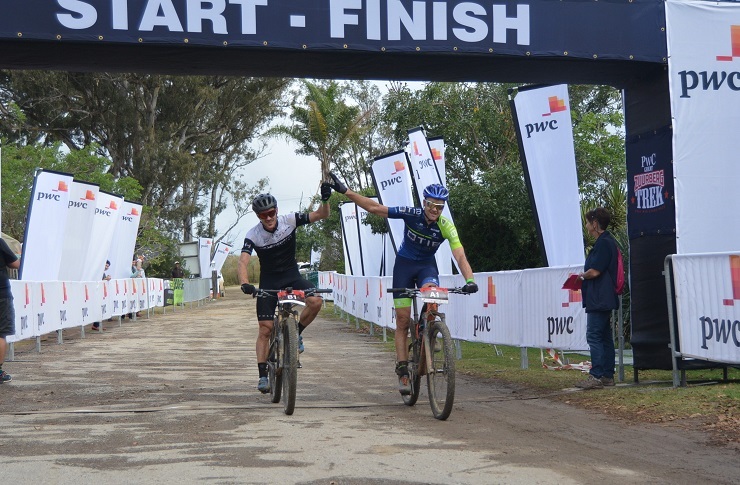 Reinhard Zellhuber and Marc Fourie (Home Ice Cream-Garrun Insurance) crossed the line in second, closely followed by Aiden Connelly and Rogan Smart (Bike Shop-Scott-Strocam). The women’s pairing of Swiss star Ariane Luthi and multiple national mountain-bike champion Robyn de Groot (Ascendis Health Spur) swept to first place in a time of 3:04:11. They were followed home by Theresa Ralph and Sarah Hill (Galileo Risk), with Imke van der Westhuyzen and Jennifer Cilliers in a distant third. After charging ahead in the first 10km of the stage, Hill said they tackled the Seven Dwarfs Drop into the river valley fairly conservatively. “On this technical descent Reinhard and Marc, probably taking a few more chances than we did, closed the gap,” he said. From that point on Hill, who won the race in 2015 and 2016, said they coasted comfortably along the flatter sections while adding some pressure where they could. “It was a case of rolling along, but with some force where possible, while also making sure we kept something in the tank for tomorrow,” he added, referring to the 88km queen stage. The final outcome was everything they could have hoped for, he said. Luthi, who took the chance to enter the PwC Great Zuurberg Trek while on a short break from racing in Europe, said they were delighted with their efforts in the opening stage. “The bunch went quite hard at the start, but we eventually managed to settle into a nice pace and were able to get ahead of the rest,” said the two-time Cape Epic women’s champion. Luthi, who is partnering De Groot for the first time, said they were gelling nicely as a team. Defending champions Neill Ungerer and Yolande de Villiers (Silverback-Morelo) set the pace in the mixed category, finishing in 3:00:49. They will take a 13-minute advantage over Ben Melt Swanepoel and Yolandi du Toit (Garmin) into stage two. Lester Tait and Andrea Shirley (Ethiopian Bodybuilding) are third. The second stage will take the field over a challenging course of 88km, including 1 750m of climbing.